The arc Gallery is fast becoming a hot spot for contemporaneous African art on the UK artistic landscape. In recent times it has played host to the work of Rahmon Olugunna, a third generation Oshogboartist and the launch of 101 Nigerian Artists: A celebration of Modern Nigerian Art, which features some of the artists, whose work will be on display. The arc returns, bigger and bolder too with an art fair of highly desirable small scale original works by contemporary Nigerian artists: Ndidi Dike, Duke Asidere, George Edozie, Okezie Okafor, Ayoola Gbolahan and Babalola Lawson. It is billed as a rare and exciting opportunity to discover old and new artists and their work. With the eyes of the art world steadily focused on contemporary Nigerian art; on the web and in physical gallery spaces, compounded by energetic trading in international auction houses, one could be misled into thinking that, the contemporary Nigerian art market is reaching saturation point. Not so. There is even more reason for the art lover to be alert, to remain parallel with developments and the creative pace. Talented, exciting artists at all stages of practice and emergence will continue to be at the heart of this visual focus. None so other than, Dike, Asidere, Edozie, Okafor, Gbolahan and Lawson – some ofNigeria’s leading and emerging artists today. The sextet has produced a collection of their respective art forms in miniature scale, presenting opportunities for viewers to acquire artwork at an accessible cost. These six artists are versed in their craft and creative influences – highlights on the Nigerian cultural geography. Yet their art is a testament of individual progression and diversity. The world is compressed or made smaller with the works’ accessibility, as the paintings themselves. Art lovers who have not been initiated as earnest collectors, or made the pilgrimage to witness some of these artists at work, can get to view a range of beautiful, desirable paintings to transfer from our wall to yours. Abstract mixed media and acrylic paintings comprise the set of small works by Dike. Her acrylics form two fluid series; in blue tones and in crimson, complemented by a third in colour blocking – being the smallest and the largest works. The works seemingly focuses on issues of consumerism, disposability and reclamation. 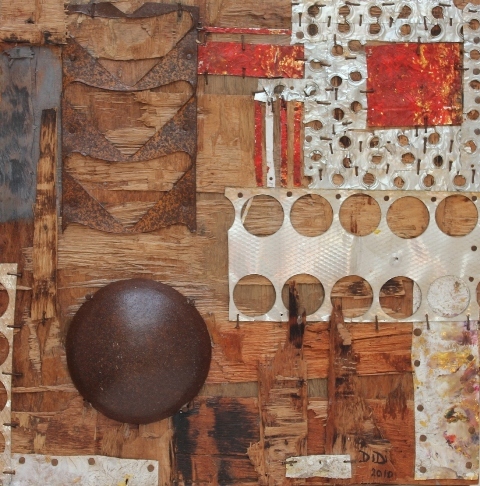 Her mix media, is typically on wood, including, cedar, iroko, marine wood, pirana, pinewood and camwood. Dike works with a limited colour palette of earthy hues, red, yellow, ochre’s and some blue tones. The circle acts as a unifying motif and point of focus. “Photography is addictive, Painting is very addictive. I am creatively addicted.” Asidere’s lyrical figures, usually in large format, convey a certain liveliness; at play, on the move and in group compositions. There is hyperactivity even in Asidere’s reclining figures, heightened by near invisible supports and the mono-colour of backgrounds; yellows, pinks, mauves, blend into the planes of the compositions – emotive and sensitive. The paintings arguably represent a departure and conflict from standard tenets of gravity in art learning, the platform from which Asidere stood as scholar. Okafor’s sculptures feature distinctively large-eyed figures formed from lines of metal and strategically- positioned apertures at varying angles. His influences are drawn from a deep-rooted ancestral lineage of artists. Gbolahan’s acrylic-enriched paintings, particularly his group portraitures express the traditions of folkloric Yoruba culture, along with religious themes. He uses symbolism and cultural metaphors in a palette of muted, hot and luminous colours to narrate his stories. Additionally, there are a complement of outside influences; European expressionism, graffiti and the Adinkra graphic lexicon punctuating his practice. Lawson’s paintings are steeped in the Yoruba narrative tradition and are a challenge to contain within the scope of miniaturisation. Broad colour palettes and distinctive forms fill the entire canvases in acrylic, pen and ink. Motifs, folklore and multi-planed figures are portrayed in geometric and organic configuration. In this collection, his four tile frontal portraits appear as a modern interpretation of theOshogbo tradition. His inspirations are derived from utility decoration, traditional carvings, even embroidery – which he seamlessly introduces into his paintings. Ndidi Dike: Dike is a graduate from the University ofNsukka,Nigeriaand is well established as a mix media artist and self-taught sculptor. She has exhibited at countless solo and group shows worldwide, (including, U.S.A,Germany,Cuba,UK and France) with works in public and private collections. Dike belongs to the Society of Nigerian Artists and the Guild of Professional Fine Artists’ of Nigeria. Her trademark material, wood, a very male domain, is fully exploited in her mix media, totems and cloth sculptures to express cultural and socio-politics. In recent years she has been producing work within the conceptual genre and painting in bold colour on canvas, while retaining a transgressive expression. Duke Asidere: Asidere is an Artist Educator and photographer – a graduate of Fine Art from Ahmadu Bello University, Zaria, where he completed his MFA in 1990. He went on to lecture in Art, including Art History at Auchi Federal Polytechnic for 5 years. His influences are the early fauvist, the expressionists and his peers, including Ben Osaghae, both born within the period of Nigeria’s celebration of independence. 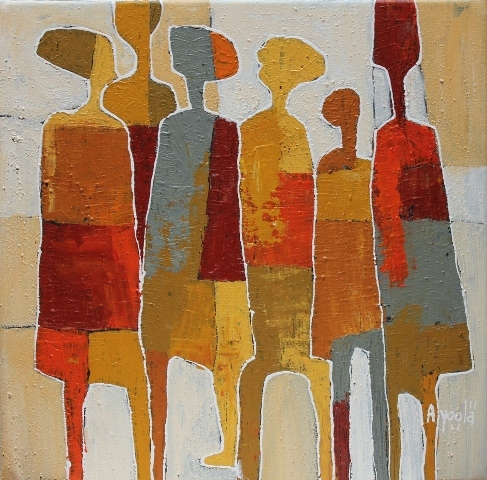 Asidere belongs to the Society of Nigerian Artists and the Guild of Professional Fine Artists’ ofNigeria. George Edozie: Edozie was educated in Nsukka andOnitshaand graduated in Fine and Applied Art, not within the landscape of the prominent art schools, but at the University of Benin, Nigeria in the 1990s. This might shed light on his perspective, as seen in the individuality of his tilted head paintings. He has taken part in several solo and group exhibitions in Nigeria and in recent years, in Cameroon,Ghanaand theUnited States. Edozie has been featured in a variety of articles and reviews. In 2010 he co-authored 101 Nigerian Artists, a recent compilation of contemporary artists in the country. Okezie Okafor: Okafor is a graduate in Art Education from the Institute of Management and Technology (I.M.T) Enugu, and holds a BA Honours in Fine and Applied Art from the University of Benin, specialising in sculpture. In 1982, he received an award in the old Anambra State Arts and Culture Competition for Graphic Design. Okafor has taken up several commissions and has exhibited in solo and group shows locally and internationally. He is a member of the Society of Nigerian Artists and belongs to the Artzero group of artist. Ayoola Gbolahan: Gbolahan was awarded a BA, Education in Fine Art from the Obafemi Awolowo University (Adeyemi College of Education), Ile Ife in 2001. He worked as a studio apprentice to fellow Alumnus and senior in the Yoruba tradition, Tola Wewe. He belongs to the Society of Nigerian Artists and African Artists’ Foundation. Since graduating, he has shown his work at several exhibitions in Nigeria and outside his homeland, including a well-received solo show at the arc Gallery, London this year. Babalola Lawson: Lawson is blessed with an apprentice’s training within the circle of Yoruba art canons. What is apparent in his paintings is an accomplishment found in the work of established earlyOshogboartists, yet the methodology of his time is on the fringe of what might be considered the established norm. His application of line and integration of forms, in acrylic and ink, create his own interpretation. Lawson has exhibited both at home in Nigeria and abroad. About the arc: arc is a centre dedicated to the appreciation of the arts, with a specialist interest and knowledge of promoting modern and contemporary African and Diaspora art. arc Gallery is wheelchair friendly and located on a converted long boat within the Upper Lee Valley(TottenhamHaleWharf). This is an area currently undergoing an urban renaissance, with beautiful nature walks, restaurants and conveniently located just 5 minutes away from Tottenham Hale underground/over ground stations, major bus routes, with free parking spaces. The arc gallery is already a “must stop” destination for art lovers. ‘Small is Beautiful’- [Miniature Art Fair] at the arc Gallery opens to the public from 24, September to Friday 7 October. This entry was posted on Tuesday, September 13th, 2011 at 11:31 pm	and is filed under Africa, Art and Culture, Nigeria. You can follow any responses to this entry through the RSS 2.0 feed. You can leave a response, or trackback from your own site.